Maybe Poodle coat had a clear utilitarian purpose, but that gift wrapping was also an irresistible invitation to creativity. Style it, layer it, sculpt it, Poodles were rocking that high hair long before modern miracles like texturizers and volumizers made it easy. It’s impossible to pinpoint that sort of historic milestone, but it’s likely that fancy Poodle clips first emerged in that seventeenth-century bastion of glamour, and gold leaf, the court of Louis XIV aka the Sun King. The sheer scale and endless glit- tery jingle of his little country getaway, Château de Versailles, was an ongoing cel- ebration of ostentation – and certainly no place for plain looking dogs. That party lasted for 72 years and the Court of Versailles set global trends for every conceivable aspect of fashion until the whole thing went downhill and everybody got beheaded. 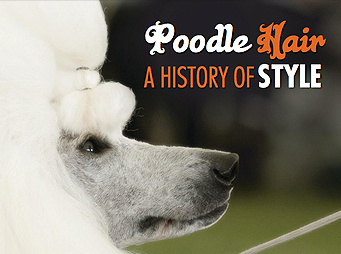 By then, Poodle styling had evolved into a specialized art. Clips were totally dictated by fads and it was painstaking work, but the elab- orate results produced with nothing but a straight razor and scissors were truly amazing. The business went mainstream in the nineteenth century thanks to technological breakthroughs like the standardized mass production of hardened, pol- ished steel tools that could be re- sharpened. That was quickly followed by the introduction of manually operated clippers (the forerunner of the ubiquitous electric clipper). Originally introduced for horse grooming, it took about five minutes for it to be repurposed for dog clipping. The judge, author, and spot-on historian Freeman Lloyd had owned and bred Poodles for 46 years when he provided a lengthy breed overview for the June 1932 AKC Gazette. Like most of Lloyd’s writing, this article was packed with priceless gems of his personal recollections like this, “About 25 or 30 years ago there was a particularly smart, up-to- date Poodle clipping establishment in Burlington Mews off Regent Street in the heart of the West End of London. This business was founded by Professor Felix, who worked his performing and leaping Siberian wolfhounds and Great Danes on the variety stages of the European capitals. Felix’s Siberians were the first Russian Wolfhounds seen in England. It was Felix and his successor, William Brown, who put the superfine touches to the art of Poodle clipping in London. Posted by Alex on Oct 26 2016. Filed under Current Articles, Featured. You can follow any responses to this entry through the RSS 2.0. Both comments and pings are currently closed.